Second Workbook & video series in a 12 month discipleship path. 5 days a week for 11 weeks with over 66 video clips to help you and your mentor take purposeful action toward changing your earthly values to Kingdom values & overcoming strongholds. Discipleship – Arrival Kit – Week 3 – Changing Kingdoms! Week 3 Day 1 – Changing Kingdoms! Leaving the Old Kingdom Behind! Week 3 Day 2 – Changing Kingdoms! Who is Running the Old Kingdom? The Bible Guy: A trusted voice in a fragile world. Week 3 – Day 2. Kingdom will clash when we start breaking Satan’s strongholds on our lives. Week 3 Day 3 – Changing Kingdoms! Solomon’s Conclusions of Earthly Kingdoms – Meaningless. The Bible Guy: A trusted voice in a fragile world. Week 3 – Day 3. Breaking Satan’s deceptions: You can buy pleasure but not happiness, breaking the prison cell of fear! Week 3 Day 4 – Changing Kingdoms! Kingdoms – Who Controls You? The Bible Guy: A trusted voice in a fragile world. Week 3 – Day 4. Breaking Satan’s “Prison of Performance by breaking the stronghold of a “man pleasing spirit” empowered by the fear of offending others. Week 3 Day 5 Changing Kingdoms! Click to go to: WEEK FOUR! Discipleship – Arrival Kit – Week 4 – You have a new Family! Week 4 Day 1 – You have a new family! Week 4 Day 2 – You have a new family! 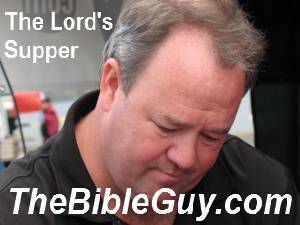 The Bible Guy: A trusted voice in a fragile world. Week 4 – Day 2. Displacement; Praise God – Holy Spirit in, pushes darkness out. Week 4 Day 3 – You have a new family! The Bible Guy: A trusted voice in a fragile world. Week 4 – Day 3. Acts 10:38 “…how God anointed Jesus of Nazareth with the Holy Spirit and with power, who went about doing good and healing all who were oppressed by the devil, for God was with Him. Week 4 Day 4 – You have a new family! Receive & Serve the Family. Week 4 Day 5 You have a new family! Dirty Carpet, Favorite Chair & Love.! The Bible Guy: A trusted voice in a fragile world. Week 4 – Day 5. Freedom of a small group in your house can be costly. Oikodomei we are all to edify! Week 4 Bonus – The lord’s supper! Click to go to: WEEK FIVE! Discipleship – Arrival Kit – Week 5 – Filled with the Holy Spirit! Week 5 Day 1 – Filled with the Holy Spirit! Week 5 Day 2 – Filled with the Holy Spirit! The Bible Guy: A trusted voice in a fragile world. Week 5 – Day 2. Displacement; Praise God – Holy Spirit in, pushes darkness out. Week 5 Day 3 – Filled with the Holy Spirit! The Bible Guy: A trusted voice in a fragile world. Week 5 – Day 3. Acts 10:38 “…how God anointed Jesus of Nazareth with the Holy Spirit and with power, who went about doing good and healing all who were oppressed by the devil, for God was with Him. Week 5 Day 4 – Filled with the Holy Spirit! Week 5 Day 5 Filled with the Holy Spirit! Agape Love, giving without expectation of personal return! The Bible Guy: A trusted voice in a fragile world. Week 5 – Day 5. Spiritual gifts used without “agape” love is called spiritual abuse, let the Love of God motivate us to serve one another. Click to go to: WEEK SIX! Discipleship – Arrival Kit – Week 6 – Hearing the Voice of God! Week 6 Day 1 – Hearing the Voice of God ! The Bible Guy: A trusted voice in a fragile world. Week 6 – Day 1. God speaks to our Spirit, Soul & Body. We are learning to listen. Week 6 Day 2 – Hearing the Voice of God ! The Bible Guy: A trusted voice in a fragile world. Week 6 – Day 2. Date God! We must set aside time to listen, Jesus is our example on how to listen to The Father. Week 6 Day 3 – Hearing the Voice of God ! The Bible Guy: A trusted voice in a fragile world. Week 6 – Day 3. How to hear God’s Voice, we start with His Words; let’s open the Bible! Week 6 Day 4 – Hearing the Voice of God !! The Bible Guy: A trusted voice in a fragile world. Week 6 – Day 4. Six ways to know that God’s voice is different than the million other screaming voices in the world. Week 6 Day 5 Hearing the Voice of God ! The Bible Guy: A trusted voice in a fragile world. Week 6 – Day 5. Listening & talking to God is prayer. Sometimes we just have to pray until…until we can hear for our situation or on behalf of others. Click to go to: WEEK SEVEN! Discipleship – Arrival Kit – Week 7 – Power over Strongholds! Week 7 Day 1 – Power over strongholds! The Bible Guy: A trusted voice in a fragile world. Week 7 – Day 1. Recognizing that our past sin can mess with our victory today is the first step. Ephesians 4:22 tells us to take off the old man or the old ways of thinking and doing things. Week 7 Day 2 – Power over strongholds! The Bible Guy: A trusted voice in a fragile world. Week 7 – Day 2. Out of order relationships; emotionally or physically is a stronghold that will slow you down spiritually or could paralyze you. Week 7 Day 3 – Power over strongholds! The Bible Guy: A trusted voice in a fragile world. Week 7 – Day 3. Adults who burned incense to a Buda statue as a child or worshiping a football team; anything you give more attention to than God, is an Idol. Week 7 Day 4 – Power over strongholds!! The Bible Guy: A trusted voice in a fragile world. Week 7 – Day 4. Modern day religion of “Consumerism” we can buy pleasure but we cannot buy happiness. May our treasures truly be in Heaven. Week 7 Day 5 Power over strongholds! Set Free from the Power of Sin! The Bible Guy: A trusted voice in a fragile world. Week 7 – Day 5. Set Free from the Penalty of sin, the Power of sin & the in time; set free from the Presence of sin! Philippians 1:6 & 3:12. Alan Hirsch states plainly, “Anyone who comes to Jesus in a Western context is already a well-discipled consumer.” How does this change our task of discipling the people we pastor? Click to go to: WEEK EIGHT! 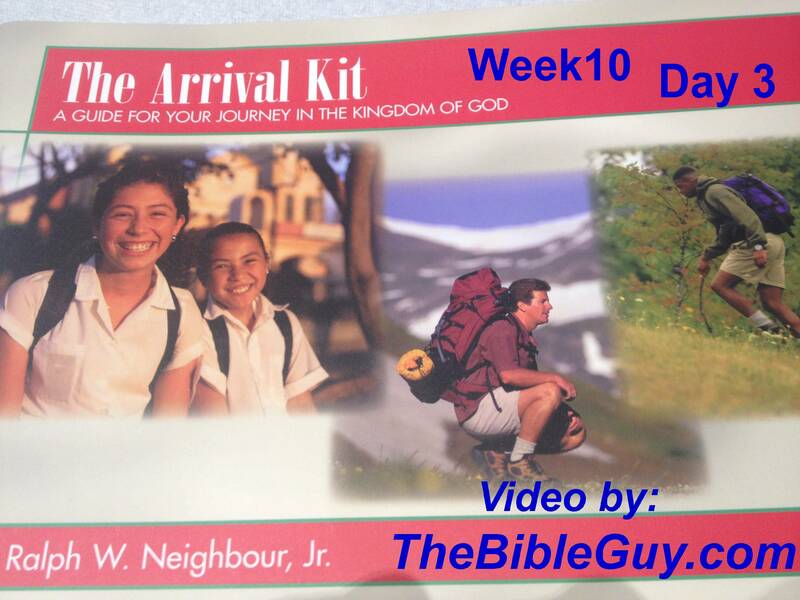 Discipleship – Arrival Kit – Week 8 – Attitudes – Enjoyment vs Fun! These videos will be loaded soon! Enjoyment vs Fun – Happiness on the inside! The Bible Guy: A trusted voice in a fragile world. Week 8 – Day 1. Happy, sad, dull, joyful, hopeful…how do you see yourself, how do others see you? Matthew 5 The Beatitudes or, the Attitude you be at! How to pluck out your sinful eye! The Bible Guy: A trusted voice in a fragile world. Week 8 – Day 2. Mark 9:47 (NKJV) “And if your eye causes you to sin, pluck it out. It is better for you to enter the kingdom of God with one eye, rather than having two eyes, to be cast into hell fire—“ Jesus you are the Lord of how I see, today I am being set free from the power of sin. Week 8 Day 4 – Attitudes! Click to go to: WEEK NINE! Discipleship – Arrival Kit – Week 9 – Battle for Men’s Souls – Evangelism! Strategy to release Spiritual Prisoners! Overcoming the false belief that Significance depends on Performance. The Bible Guy: A trusted voice in a fragile world. Week 9 – Day 4. Showing, Modeling, the unconditional love of God to others who are enslaved to significance through performance. How to die before you are murdered. The Bible Guy: A trusted voice in a fragile world. Week 9 – Day 5. Acts 20:24 (NIV)”…I consider my life worth nothing to me; my only aim is to finish the race and complete the task the Lord Jesus has given me—the task of testifying to the good news of God’s grace. Click to go to: WEEK TEN! Discipleship – Arrival Kit – Week 10 – Face the Enemy – Wrestling Match! Life in Your Small Group; Powerful! The Bible Guy: A trusted voice in a fragile world. Week 10 – Day 2. Battles are fought by armies and your group is a powerful squad! Attack the Kingdom of Darkness! The Bible Guy: A trusted voice in a fragile world. Week 10 – Day 3. Equipped with weapons to enter the Kingdom of Darkness to rescue unbelievers & bring them to Christ (Ephesians 6:14). Demons: Three levels of Spiritual Warfare. The Bible Guy: A trusted voice in a fragile world. Week 10 – Day 4. Deliverance from: Demon Possessed, Occult or groups of Demon Possessed & Geographical Demons. The Cost of being a Witness! Click to go to: WEEK ELEVEN!